So, I got a taste to venture a bit further. As your average teenager, I was drawn to immersive 3d environments. I spent countless hours in the virtual worlds created by the great game development studios of the day. Starting out in game development isn’t easy. Building a game is very complex undertaking. However, there are enough frameworks and kits out there to get started quickly. 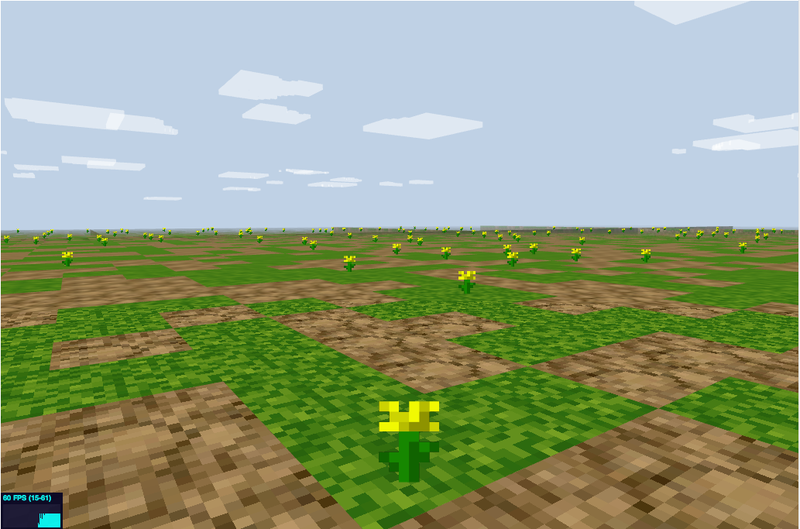 A Voxel engine is based on the concept modelling the world in voxels or volume pixels. The math is pretty specific, but VoxelJS abstracts the hardest part in an easy to understand API. The original authors’ original intention was to create a learning experience. On a free saturday afternoon a few weeks ago, I followed Shama’s 10 minute tutorial getting VoxelJS up and running. After an hour of toying, I was roaming around in mmy own 3d world. First thing I hacked together was my own terrain generator. The tutorial uses the perlin-terrain-generator which uses the Perlin noise algorithm to generate a basic heightmap. I tinkered with the code to get a feel for how things work and finally came up with my own extremely expensive flat terrain generator. At the moment, I’m toying with sprites and sprite support. It was surprisingly easy to wield the ThreeJS SpriteMaterial class and get it to work with VoxelJS. Writing an optimal implementation which includes atlas support, is the real challenge here. I’ve barely scratched the surface. There’s a loads more out there. I don’t really have a game plan beyond exploring the API and see what I can do with it. My current thinking direction involves visualization of available open data sets. It sounds like a cool idea to take data from public instances, repurpose them in a 3D environment and come up with an element of gamification. So far, it’s been refreshing to look what else is out there. However, the vote is still out how far I’m going to pursue this little experiment.